Studies show that sales of small businesses to new owners remain steady. Who’s doing all the selling and buying? A report from BizBuySell.com says that, while it’s mostly middle-aged white guys doing both, entrepreneurs emerging from the millennial generation are a far more diverse group. “Similar to sellers, small business buyers are largely Caucasian, college-educated married men in their 40s and 50s,” according to BizBuySell’s recent white paper, The Demographics of U.S. Small Business Buyers & Sellers. Only 19 percent of buyers age 50 or older identifies as an ethnic minority. 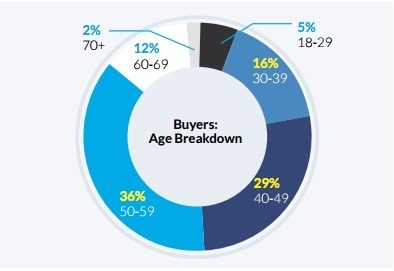 But among 18-29 year-old buyers, 49 percent do. 36 percent are college graduates; 22 percent hold post-graduate degrees. 28 percent have no college degree or trade/vocational background. 70 percent identify as Caucasian, 12 percent Asian/Pacific Islander, 7 percent Hispanic/Latino, and 7 percent as African American. Nearly 10 percent are veterans, and most of those are over the age of 50. And 25 percent of those shopping for businesses are not natural born U.S. citizens; 15 percent say they are naturalized citizens, 8 percent permanent residents, and 2 percent visa holders. 39 percent have one parent or grandparent who owned a small business; 16 percent have two. 49 percent plan to exit their small businesses in the next five years, but only 29 percent are currently prepared for the sale process. 60 percent are age 50 or older. 57 percent have a household income greater than $100,000. And burnout motivates more younger owners to sell; 30 percent of sellers in their 30s and 26 percent in their 40s attributed their sale intentions to burnout, while only 21 percent in their 50s and 11 percent in their 60s did. Graphic: from BizBuySell.com’s report The Demographics of U.S. Small Business Buyers & Sellers, available online.